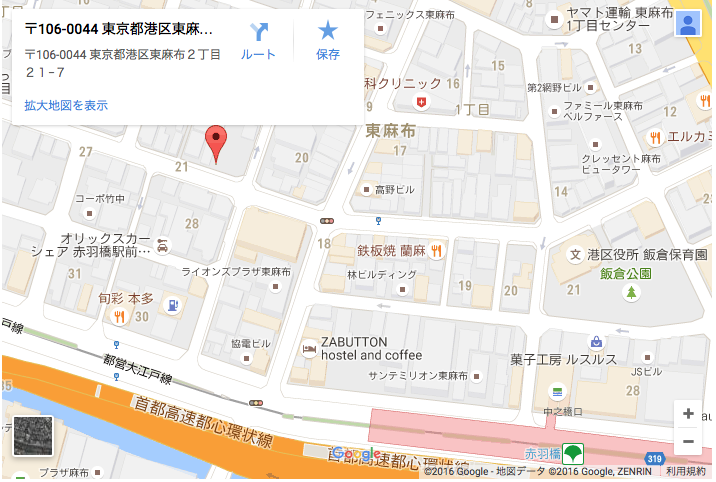 Since October 10, 2016, The Embassy of Panama and The Consulate General of Panama in Tokyo have been relocated to following adress. On May 23, 2016, the Executive Board of the International Monetary Fund (IMF) concluded the Article IV consultation1 with Panama. Panama has had the highest average growth in the region over the past decade and is expected to continue to have one of the strongest growth rates in Latin America, set against a backdrop of low inflation, a stable financial system, and a declining current account deficit. GDP grew by 5.8 percent in 2015, and growth is projected to remain around 6 percent in 2016 and over the medium term. The economy will be supported by the expected opening of the expanded canal and lower fuel prices, which will counterbalance the effects of slowing global growth and U.S. dollar appreciation. Over the medium term, the increase in canal transit, a dynamic service sector, and investments in the energy, mining, and logistics sectors should help maintain vibrant growth. Inflation is expected to remain subdued in 2016..
Panama Canal Expansion will be inaugurated on June 26, 2016. 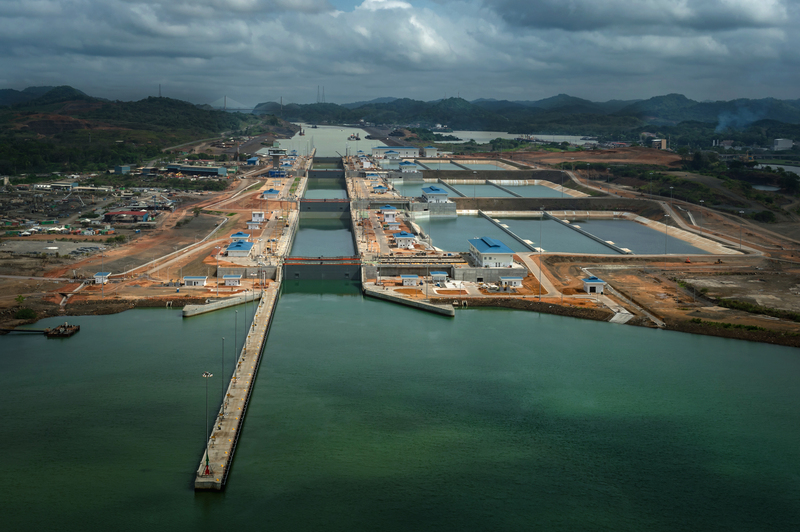 The Panama Canal Authority (ACP) announces that the Panama Canal Expansion will be officially inaugurated on Sunday, June 26, 2016. 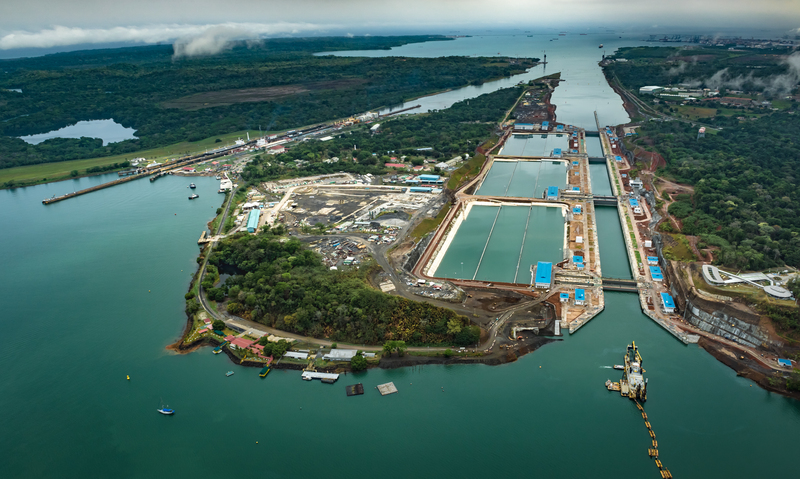 PANAMA CITY, PANAMA (May 26, 2016)– The Government of Panama announced today the commencement of three major new transportation and energy megaprojects with international investments and partnerships worth over $4 billion. 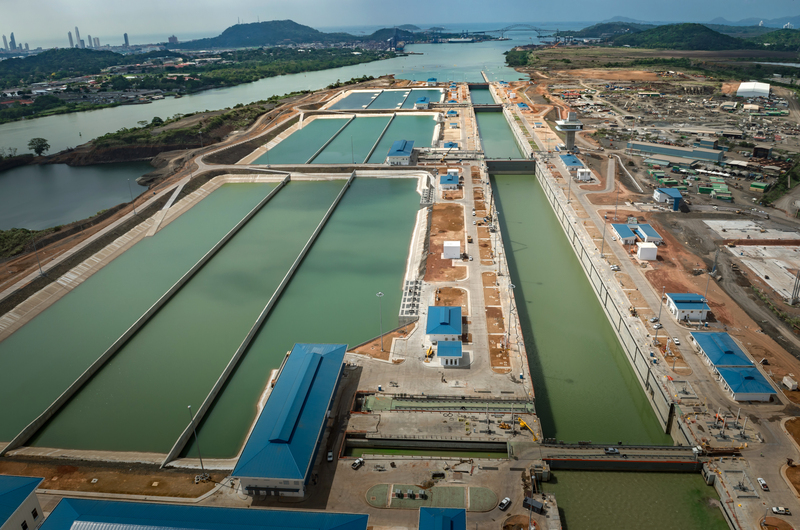 The megaprojects include construction of Central America’s first natural gas based energy plant, Line 3 of Panama’s metro, and the fourth bridge over the Panama Canal. These projects continue a series of massive infrastructure initiatives successfully launched and completed by the Government of Panama as part of President Juan Carlos Varela’s 5-year development plan that has already secured investments of over $19 billion for transportation, housing, basic sanitation and water infrastructure projects. 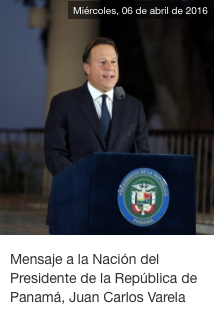 MESSAGE TO THE NATION FROM JUAN CARLOS VARELA R., THE PRESIDENT OF THE REPUBLIC OF PANAMA. Since the discovery of the Isthmus of Panama we have always been a meeting point of civilizations at the service of global trade and the world. Today we are the most stable and with greater growth economy in Latin America. We are the hub of the Americas, which facilitates communication and connectivity of the continent with the rest of the world. Panama is the regional headquarters of more than 100 transnational and we are a country where the law and the legal security, with an economy open to foreign investment and a government committed to transparency, accountability, the separation of powers and the strengthening of democratic institutions. The massive filtration of documents on corporations of a Panamanian law firm with operations in different jurisdictions, has given rise to a controversy that shows a global problem. Panama wants to make it very clear that this situation that has been badly named “The Panama Papers”, is not a problem of our country but also in many countries of the world, whose legal and financial structures are still vulnerable to be used for purposes that do not represent the common good of the citizens. In 21 months of our administration of government, the Republic of Panama has taken decisive steps in favor of transparency and strengthening of our financial system and platform of services, which allowed us to: exit from the gray list of the Financial Action Task Force (FATF) in this year 2016 and move to Phase 2 of the peer review of the Global Forum, with which the international community has validated our legal framework to comply with international standards. In addition, beginning in January 2016 we attended the need to provide certainty as to the identification of the owners of the shares of corporations, as a demonstration of our firm commitment to transparency. We recognize that we must continue to make progress in our State agenda of that we have set ourselves to shield our institutions, but we are not going to allow this media narrative to define us as a country. Earnest and responsible Governments do not negotiate the adoption of international obligations through the media but through diplomacy, through serious, responsible and constructive dialog. I have asked Chancellor Isabel de Saint Malo, to contact the member countries of the Global Economic Forum and to reiterate to the Organization for Economic Cooperation and Development (OECD) our willingness to engage in dialog with respect to reach agreements that contribute to the economic development of our countries. And as is said in its own motto, our country and our government is also committed to the building of a stronger, cleaner and just world. The Government of Panama, through our Ministry of Foreign Affairs will create an independent committee of national and international experts of recognized experience, to evaluate our practices and propose the adoption of measures which will be shared with other countries of the world, to strengthen the transparency of the financial and legal systems. We will not only work internally but also lead an effort for the benefit of the rest of the world. I want make it clear that Panama will continue to cooperate with other jurisdictions as we have been doing both in judicial matters to prosecute offenses that are outlawed in our Criminal Code as well as in terms of the exchange of information to comply with the international treaties ratified by the Republic of Panama. We reaffirm our commitment as responsible country, respectful of international law and cooperative with the efforts of the international community in search for solutions to this global problem. At this time we ask all countries to make use of all diplomatic channels and maintain mutual respect. To the Panamanian people, I ask that we continue to work together to strengthen our country and to defend the highest interests of our nation. The plenary of the Financial Action Task Force (FATF) held today in Paris, France, approved that Panama exits from the grey list of this entity. During the meeting, FATF confirmed that Panama has the legal, regulatory and institutional framework defined in the Action Plan for the prevention of money-laundering, the financing of terrorism and the proliferation of weapons of mass destruction. “This is a triumph of all Panamanians, of a country that worked together, both public and private sector, and achieved the necessary consensus to safeguard the best interests of our nation. This allowed the adoption and implementation of a new regulation which places Panama at the forefront in the field of the fight against money-laundering”, emphasised the minister of Economy and Finance, Dulcidio De La Guardia. From July 2014, Panama has made rapid advances in the implementation of the 19 points of the action plan previously agreed with FATF to strengthen the systems of supervision and control. 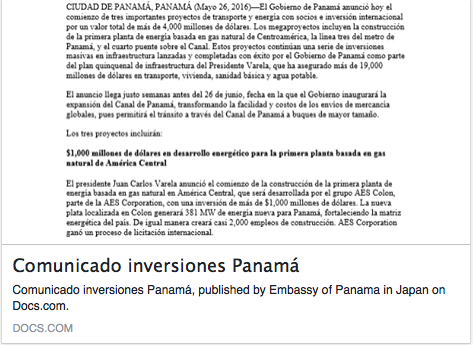 In 2015, during the plenary of the Agency held in October, the Financial Action Task Force recognised the compliance of Panama of the plan at a technical level and approved the on-site visit performed from the 12th to the 14th of January of 2016. The FATF plenary in Paris was attended by the Minister Dulcidio De La Guardia; the Deputy Minister of Finance, Eyda Varela de Chinchilla; the director of the Financial Analysis Unit (Unidad de Analisis Financiero – UAF, for its acronym in Spanish), Alexis Bethancourt; and the Superintendent of Banks, Ricardo Fernández, among others. The Ministry of Public Works (MOP) has opened from today until Friday 22 of January the prequalification process for companies, firms, groups (consortia or accidental associations) that wish to obtain the prequalification stipulations for bidding on the Design and Construction project for the fourth bridge over the Panama Canal. Through this process, companies will be selected that qualify for the contractor selection act for bidding on this mega work, which aims to serve as infrastructure for crossing the Canal for the public transportation systems planned to bridge the city with the West of the Canal. Specifically, Metro Line 3. To accomplish this process, the MOP will initially invite companies that have obtained the prequalification stipulations to a tour of the project site and an explanatory meeting of technical aspects. · Build the necessary infrastructure to ease the current traffic crossing over the Panama Canal and absorb future demand for traffic. 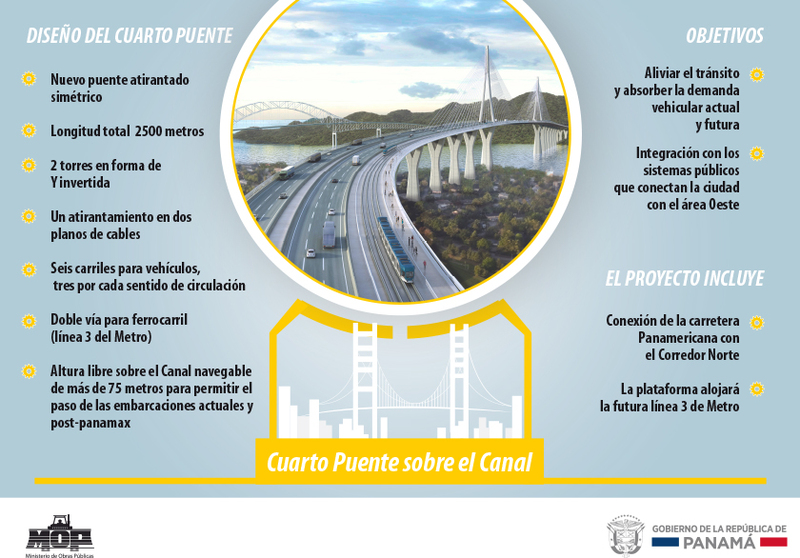 · Expand, rehabilitate and improve the high capacity road network of the City of Panama by way of the continuity of the Northern Corridor and the construction of the necessary connections to the city, creating a road network in line with current and future traffic demands. · Redistribute traffic of the city to the new infrastructure, alleviating the current traffic existing in the South (Cinta Costera and Balboa Ave.) and generally improving the service level of the main roads. The fourth bridge over the Canal carries a symmetric cable-stayed design with an approximate length between expansion joints of 1118 meters, two towers in the form of an inverted Y, and stiffening in two planes of cables with semi harp configuration. Six lanes for vehicles are included, three for each direction; double rail track with a total width of about 54 meters; and clearance of the waterway over 75 meters to allow the passage of current and post-panamax vessels. The east tower is set on the eastern shore, near the Balboa port, while the West Tower will be located in a large area of shallow water near the ship channel. The project consists of the design and construction of all necessary works to connect the Northern Corridor to the Pan American highway through a new highway; it will be a platform that will host the future Metro Line 3; the new highway will connect with the Pan American Highway and its future expansion in the West area. This mega project is expected to be built over a period of four years, and will benefit an estimated population of 1.7 million inhabitants. 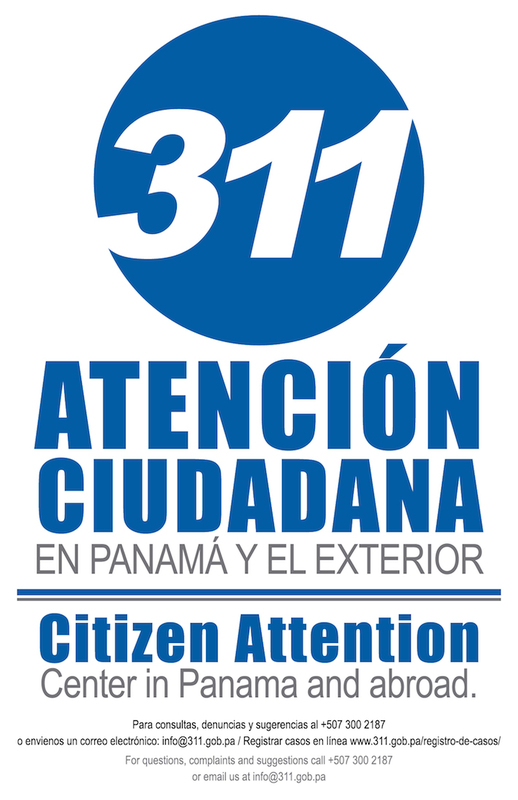 The Platform 311service is available for the citizens living in Panama and overseas. Through this channel, the citizens can make inquiries and/or transmit a complaint in a fast and rapid way, which will be transferred to the responsable government entities to offer an immediate response. This system is a confidential and secure , allowing citizens to follow up, obtain information, and know the status of their requests. Furthermore, it supports the initiatives of transparency driven by this administration. 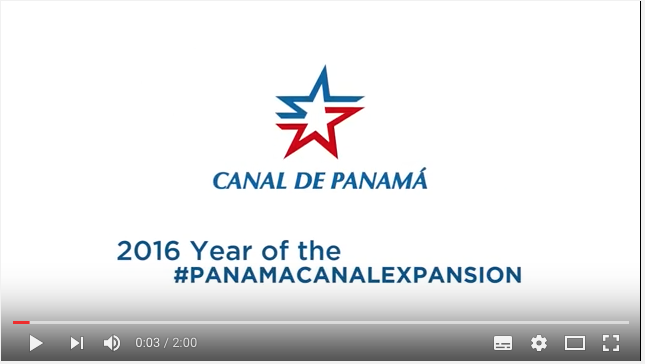 Panama announces that the Expo Invest will take place from June 9 to 11, 2016, at Atlapa Convention Center in Panama City, with the slogan “Bridge for Business, Link for Investment”, which is being organized by the Ministry of Commerce and Industries (MICI) of Panama, through the agency for the Investment Attraction and Export Promotion (PROINVEX). 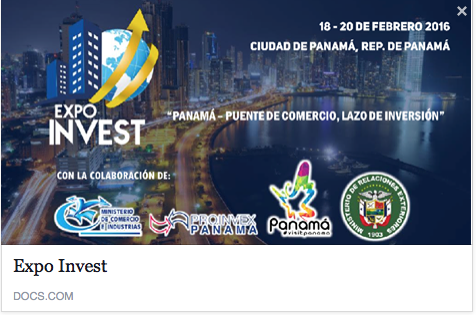 This event will bring together the most important actors in the economic and investment sectors from all over the world, being a big opportunity to promote the participation of those companies which seek to establish their affiliated companies and headquarters in Panama. 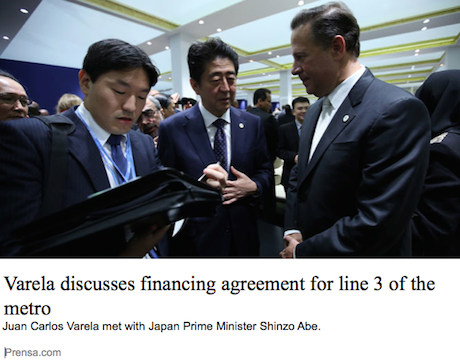 On November 30th, President Juan Carlos Varela held a bilateral meeting with Japan Prime Minister Shinzo Abe to discuss the financing of Line 3 of the Metro. The meeting was held within the framework of the United Nations conference on climate change in Paris. After the meeting, it was agreed that negotiations on the financing of the Metro expansion will continue when Panama sends a technical delegation to Tokyo. That delegation will be tasked with finalizing the agreement so that the project can begin before the end of 2016. 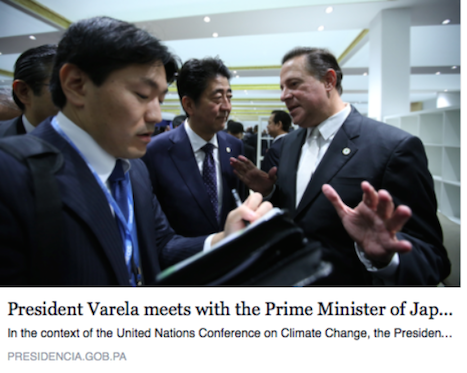 “It’s an infrastructure project very important to my administration which will serve to showcase Japanese technology to the region,” Varela said. Line 3 will extend from Albrook to La Chorrera. 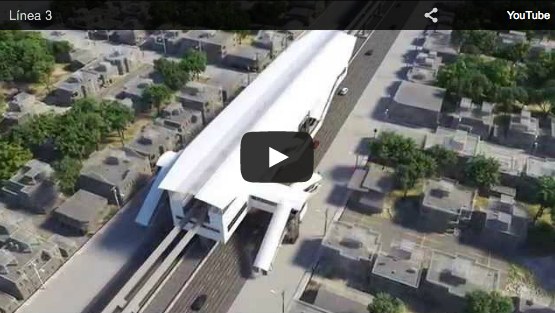 It will be 27 kilometers and have 14 stations. It will also include the construction of a bridge over the Panama Canal to accomodate the train as well as vehicular traffic. The government has already started work on line 2, which will extend service from San Miguelito to Nuevo Tocumen. Varela also invited the prime minister to the opening of the Panama Canal expansion in 2016.